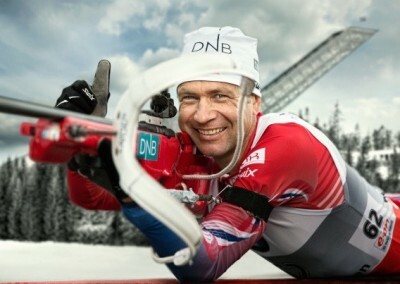 Ole Einar Bjørndalen impressed and inspired not just his fans and fellow athletes at the Biathlon World Championships in Oslo over the weekend, but also those with any doubt about accomplishments after age 40. 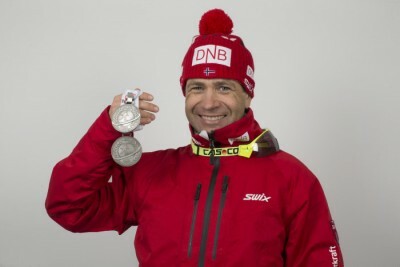 At 42, Bjørndalen won his 42nd World Champiopnship medal in hard competition, and the accolades came pouring in. He’s a living legend and living proof that being in one’s 40s is far from being over the hill. Instead of resting on his laurels or throwing in the proverbial towel, Bjørndalen kept training hard even after winning two more gold medals at the last Winter Olympics in Sochi. He wanted to win again, on home snow in Oslo, and he did. First he won a silver medal in the men’s 10-kilometer sprint on Saturday and then he did it again on Sunday, winning more silver in the 12.5 kilometer pursuit. Both were claimed to be as good as gold for Bjørndalen, and the cheering went on for a long time. The new medals come in addition to the 40 (19 of them gold) medals he already held from past World Championships plus 14 Olympic medals (eight of them gold) and six overall World Cup victories. That puts his career total at 62 medals, so far. It was a great weekend for the Norwegians in general, especially when Tiril Eckhoff won the gold medal on Saturday in the women’s 7.5-kilometer sprint. It was her first victory in a World Championships and she cried with joy, live on camera. She didn’t do nearly as well on Sunday, placing a relatively lowly 17th in the pursuit, but it didn’t matter much. “Winning gold here at home (she’s from the Oslo suburb of Bærum) makes up for it,” her big brother and coach Stian told newspaper Aftenposten. Emil Hegle Svendsen also recovered from poor performances earlier in the season to win the bronze medal in Sunday’s pursuit, but it was Bjørndalen who made the biggest headlines. He came in right behind the 15-year-younger Martin Fourcade of France both Saturday and Sunday, after the French star had all but written him off earlier in the season. “He didn’t think I’d come up to the (winners’) podium,” Bjørndalen said, “he said that both before and after Christmas.” Fourcade underestimated his rival but Bjørndalen admitted he was a bit surprised himself. “Yes, because in the pursuit, (the competition) was at a very high level,” he told reporters on Sunday. “Therefore this silver is fantastic, even though the sprint silver is probably the one I’m most pleased with.” He also had said earlier that Forcade “is more complete than me” and that Fourcade deserved all the superlatives he’s been receiving as well. Both Fourcade and Bjørndalen said they were also happy to meet and be congratulated by King Harald after the race: “He (the monarch) was in good humour,” Bjørndalen reported. It’s been 22 years since Bjørndalen took part in the Winter Olympics for the first time, at Lillehammer in 1994. He won his first World Cup victory just two years later and his first Olympic gold at Nagano in 1998. He won his first overall World Cup that year as well and it’s been a medals rush ever since, in Olympic, World Cup and World Championship action. He’s considered one of the most dedicated and respected athletes the world has ever seen and he’s a big hero in his hometown of Simostranda, located between Drammen and Hønefoss, west of Oslo. In honour of his participation in yet another World Championships at age 42, the local newspaper Bydgeposten temporarily changed its name to BjorndalenPosten when competition began last week. There’s already a statue of him in the town, and Bjørndalen is also now a member of the International Olympic Committee. Despite his 62 major career victories, he thinks he’s in better shape than ever before. “I’m skiing faster and shooting better,” he told newspaper Dagsavisen before competition began. He’s acutely aware that his rivals are better, too, thus his own happy surprise over the weekend. “There’s a higher and more even level now, and around 10 to 15 who can win,” Bjørndalen said. He proved he’s still one of them. Competition in the World Championships at Holmenkollen was taking a break on Monday and Tuesday, but set to resume Wednesday with a 15-kilometer “normal program” skiing and shooting race for women, followed by a 20-kilometer race for men on Thursday. More relays were planned for Friday and Saturday, with a mass start race and closing events on Sunday.